���� Situated at the base of the Sierra Madre Mountain Range just five miles from Encampment and only 30 minutes south of historic Saratoga, Wyoming is the Jensen Ranch. Almost completely surrounded by the BLM, this scenic 4,198 acre mountain ranch is comprised of 440 deeded acres, 3,170 acres BLM lease and 588 acres state lease. The diverse habitat on the Jensen Ranch has made it a popular refuge for mule deer, elk, antelope and black bear. Nestled against an aspen grove on the north end of the property is a well appointed 3,518 square foot home with incredible views of the Snowy Range and Medicine Bow Peak making this ranch an exclusive private retreat for the outdoorsman. ���� Easily accessed via the Blackhall Mountain Road, the Jensen Ranch spans over a mile of the West Fork of Cherokee Creek, a year round tributary providing ample water for wildlife. Rising from 7,900 ft. to 8,800 ft in elevation, the hillsides of this picturesque drainage are a nice mixture of open sagebrush, aspen groves and stands of mature spruce, fir and lodge pole pine. The combination of plentiful food, water and cover has allowed wildlife to thrive on the ranch. Historically the ranch has been used as summer pasture and has ran 110 head of cows for 3.5 months. The Jensen Ranch would qualify for landowner elk and deer tags and is in area 13 for elk, a general elk unit, allowing for additional license opportunities. To see wildlife on the Jensen Ranch CLICK HERE. It is not uncommon in the fall when the elk begin to rut to hear the echoing bugles of bulls vying for cows in the aspen behind the home. The Medicine Bow National Forest is just a mile south of the property and can be easily accessed via the county road or by a private well traveled road that follows the creek up from the home. For the avid anglers the world class waters of the North Platte and Encampment Rivers are a short drive away. ���� The home was carefully positioned against an aspen grove to ensure privacy and capitalize on the incredible views this ranch has to offer. With the stunning views in mind, the home features vaulted ceilings, large picture windows, an open loft and a wrap around deck with a large gazebo. This beautifully built three bedroom, three bath home also enjoys a well appointed kitchen, large great room, dining room, family room, work room, attached two car garage and ample room for storage. The master bedroom features a fireplace, office, jetted tub and access to the wrap around deck. The fire place is built into a massive moss rock wall that stretches from the walk out basement to the vaulted ceilings. ���� Given its location, size, topography and recreational attributes, the Jensen Ranch represents a unique ownership opportunity in one of the most tax friendly states in the nation. The ranch is just four hours from Denver and for private aircraft it is 30 minutes from Shively Field Airport in Saratoga, an 8,800� X 100� lighted runway. Saratoga is one of Wyoming�s best kept secrets and features fine dining and the Old Baldy Club, a prestigious member only, championship level 18-hole course with blue ribbon fishing and superior accommodations. 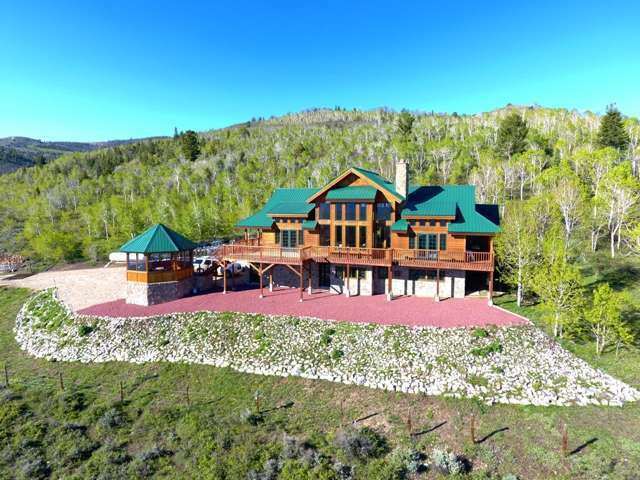 To arrange a private tour of the Jensen Ranch call James Land Company today at 307-326-3104.